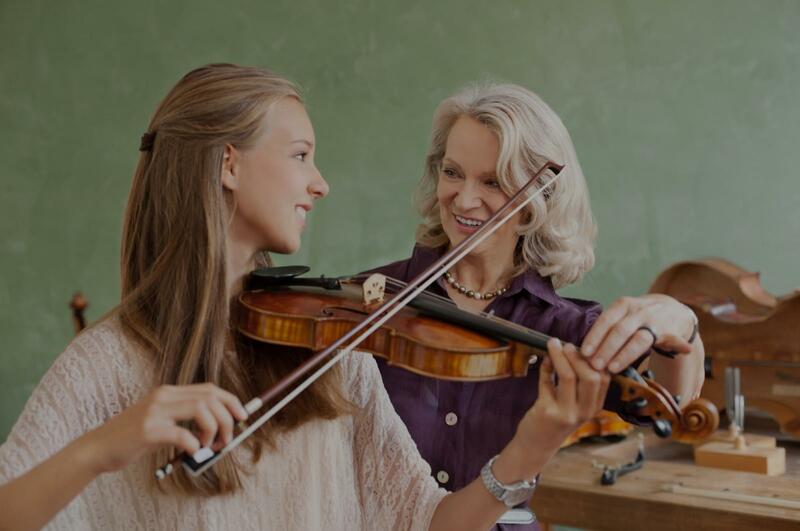 Jericho, NY Violin Lessons Near Me | Fun Classes. Top Tutors. Check out some of our most popular teachers near Jericho, NY including New York, Brooklyn, Bronx, Jersey City and Astoria. I have been a freelance violinist and a professional violin teacher for the past 30 years. Playing in the orchestra and teaching students are two of my greatest passions in life. As a private violin instructor, I firmly believe that education is impossible without student motivation and passion. As much as I love teaching, my best experience is also learning from my students. - Tbilisi State Music Academy - 7 year degree in Violin/Piano performance. - Tbilisi State College of Music and Arts - Bachelor's Degree in Violin Performance. - Tbilisi State Music Conservatory - Master's Degree in Violin Performance. usician in Europe and the United States. Music studio set up in the living room. We will start off our lessons with introductions to the violin. In addition to posture and being able to appropriately hold and play the violin, you will develop a thorough understanding of basic music theory. We will incorporate music theory (reading notes, note values, notation, etc.) to every lesson. You will typically use Suzuki books to learn and develop different violin techniques. We will also spend a lot of time working on etudes/scales to compliment those newly learned techniques. from Hamilton College, I taught both 1 on 1 and group violin classes at Real Brave Music School in Queens, which allowed me to incorporate the Suzuki method into my own curriculum for beginner violinists. In November of 2016, I moved to Chongqing, China to work at Musicool Music & Art, where I was a Music Instructor, an English- Chinese Translator, and the Education Program Coordinator. I had the wonderful opportunity to develop comprehensive and innovative curricula to match the needs of multiple age groups, lead classes in both English and Mandarin Chinese, and assist other teachers in accurately translating class content. I was also responsible for overseeing program/curriculum development for the rest of the company, ensuring that each class had engaging and interactive elements. Please contact me for more information! Very patient instructor. Can't wait to take another lesson. I am a classically trained violinist and have been playing since age 3. I grew up taking lessons and absolutely hated it because of very strict teachers. My goal is to teach balanced lessons, so they will be fun but you will need to do your best! That is all I ask. I can teach you how to play anything. I can also teach non-traditionally, so that means teaching you how to use pedals to create new sounds with your violin. I can also teach you how to write your own music. Can't find a teacher in Jericho, NY? "Naoko is a fantastic violin teacher. Patient, encouraging, skilled and knowledgeable. My 12-year old daughter can’t wait till her next lesson!" New York, NY teacher: Naoko T.
"Lauren is an excellent teacher for adult students! essons.com and could not be more pleased with her!! She has taught me so much in my first four weeks. She's patient with me and encourages me when I get discouraged with my play. She is quick to answer the numerous questions I have. She is an extremely talented musician with a talent for teaching. She pushes me in my weekly assignments and ensures I've mastered one level before we move to the next. Thanks Lauren!!" New York, NY teacher: Lauren C.
"Christina was excellent. She was on prompt nice and interacted nicely with my daughter. I would definitely recommend her." "Mr. D is a very good teacher at violin. I give him 5 stars because he is nice and a good teacher." New York, NY teacher: Stephen D.
"Martin is a colleague of mine; we have worked together at Lincoln Center and in recording studios in NYC. ent and knowledgeable. He is well versed in the Dounis method of violin pedagogy." New York, NY teacher: Martin S.
"Thomas is very patient and kind to my autistic son who is taking violin. He wastes no time getting started with the lesson and uses every moment wisely. He is a gifted teacher and I feel confident that my son will make great strides with Thomas." "Great instructor. Organised way of teaching. She makes learning easy. I like it." "If you are looking for an excellent teacher that can help you develop both technique and musicality, I highly recommend Zhana. e of studying with her for seven months as an adult beginner, and I have learned so much. I come out of every lesson feeling like I’ve made progress—even when I am unhappy with how I am playing, Zhana helps me understand a key thing that I need to do to play better. She is able to explain things so that you don’t just conceptually understand, but so that your body can understand too (for all those times that your brain knows what you need to do but your finger/wrist/arm/etc. won’t cooperate). Because she has played as a professional performer, Zhana draws on her experience to guide you to bring musicality and emotion to whatever you’re playing… even if you’re still in the early Suzuki books like me. I’ve studied with many teachers in the past (in school and privately) for piano, clarinet and voice lessons, so I know that the ability to teach across this broad spectrum of skills is rare. Zhana isn’t just a great teacher, she is also a wonderful person. I am moving out of the city for a year, but I fully intend to continue lessons with her when I return!"